This is also the third of my Influences series that features photographers whose work has been a inspiration to me as a photographer. For more on Dorothea Lange, see part 4 of our series on The History of Street Photography. Dorothea Lange (26 May 1895 – 11 October 1965) was born to offspring of German immigrants in Hoboken, New Jersey as Dorothea Margaretta Nutzhorn. Her father worked as a lawyer and was elected as a state representative at age 27. Dorothea, like the other iconic photographers, spent years learning her skill before reaching her peak. At 22, she and a friend decided to leave NYC and see the world, via San Francisco. Their short stay lengthened when their money was stolen and Dorothea took a job in a photographer’s studio, using her mother’s maiden name since her father had abandoned the family when she was 12. It had been the second traumatic incident of her childhood, the first being when she developed polio at age 7, weakening her right leg and leaving her with a permanent limp. The effects of polio would also follow her throughout her life, combining post-polio syndrome with bleeding ulcers that weakened her during the last two decades of her life. Still, in 1918, limping, young, and inexperienced, within a year she’d opened a private studio with a wealthy clientele. By all accounts, she was dashing, charismatic, and bold in her pants, beret, and green cape. In this, she exhibited the four basic skills found in many famous street and portrait photographers: 1) The ability to the shot as it happens; 2) Enough confidence enough to take the shot; 3) Sufficient charm or people skills that subjects show their true natures to the camera; 4) Awareness of the mechanics of photography so that they can got the shot they wanted. Dorothea did that in spades. 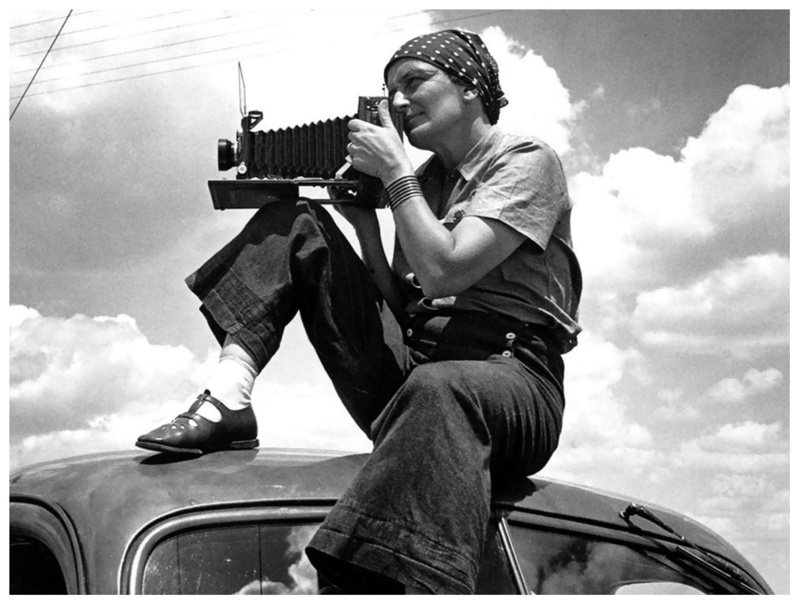 By the mid-30s, she had left her photography studio for the street, doing her most iconic work for the Farm Security Administration between 1935 -1939 and distributed free to newspapers. 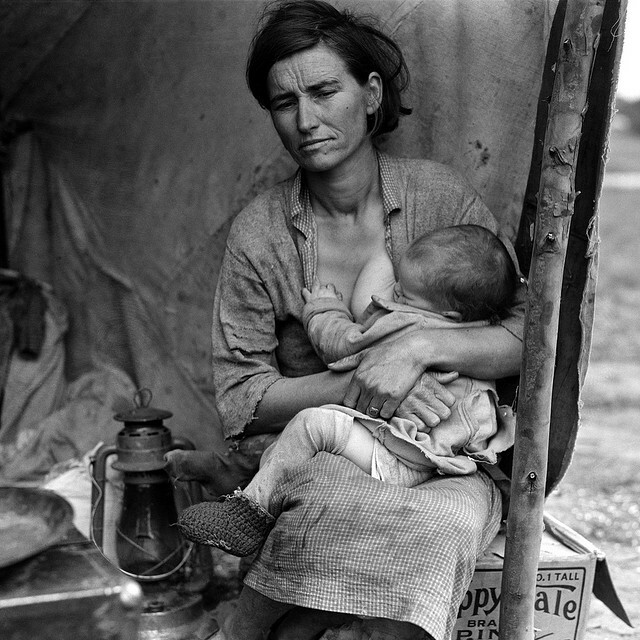 She’s best known for her photo named “Migrant Mother” and depicting Florence Owens Thompson. 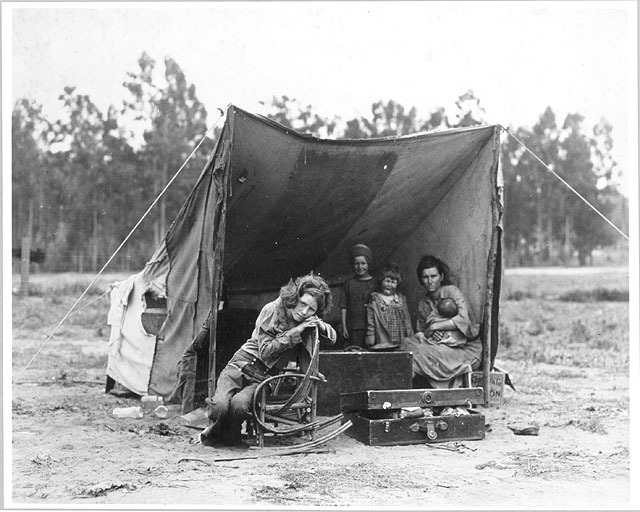 Florence Owens Thompson, Nipomo, California – in the unretouched photo, Mrs. Thompson’s fingers could be seen on the tent pole. The thumb is darkened here to obscure it. Contrary to how the shot appears and Ms. Lange’s story, Mrs. Thompson and her children were actually just sitting by the roadside in a ragged tent, awaiting the return of her husband and two sons, who’d gone to seek repairs for their car’s broken radiator and timing chain. They’d been stranded in a pea picker’s camp when the car’s timing chain snapped. The crops had been ruined by frost, and there was no work. 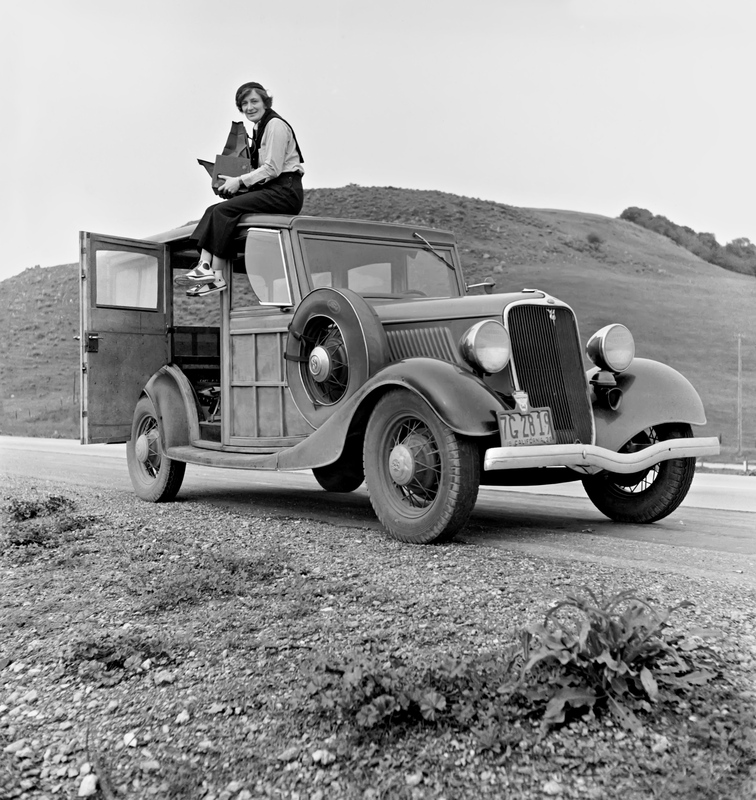 After her husband left, Dorothea Lange showed up with her camera. Mrs. Thompson later claimed that the photographer never asked her any questions and she never mentioned any tires, all of which were on their car. It isn’t clear if Dorothea made up the story on purpose. She took 6 photos in 10 minutes, but used only 5. In the famous photo, the children turn away because they didn’t want their photo taken a 6th time. Here, in the first shot, at a distance, they are more relaxed. In truth, as the family revealed later, the photograph made them all feel ashamed to be poor. Mrs. Thompson was less than thrilled when her identity was disclosed decades later, stating that Dorothea had promised her the photos would never be published. Thus, we find the 5th and final trait of all the great ones: if you must lie to get the shot, then lie, dammit. This is the documentary photographer’s moral dilemma. Although the above is the most well known, there are others from that set, including a very candid shot of a type Ms. Lange would known for — capturing the reality of impoverished motherhood as it was, without a veil or mystique. Life was and is hard for the poor. Mrs. Thompson was only 32, though she looked at least a decade older. Sharecropper family near Hazlehurst, Georgia. Migratory boy in squatter camp. Has come to Yakima Valley for the third year to pick hops. Mother: “You’d be surprised what that boy can pick.” Washington, Yakima Valley. Mother and baby of family on the road. Tulelake, Siskiyou County, California. 1939. Find a way, get the shot. During World War II, she produced her second most famous work, documenting Japanese Americans falsely interned by the U.S. government. After the war, she was hired on to teach at the first fine art photography department at the California School of Fine Arts (CSFA) along with Imogen Cunningham and Minor White by Ansel Adams who’d also taken photos of the Japanese’s internment. She later co-founded the magazine Aperture, but little of her work after 1952 is as famous as her Depression-era work. First graders, some of Japanese ancestry pledging allegiance to the American flag in 1942, shortly before the internment of Japanese Americans. Wonderful. I guess my early desire to be a war photographer, was actually a desire to shoot street. I wanted to capture life as it happened in all it’s rawness and honesty, even if the captured moment was of a moment that would be contrived under the guise of art. The story that goes with the shot is the art, as much as the shot is the art. There is an air of wonderment and fantasy about a good shot that bares absolutely no relation to the actual event and the history therein. Photography, like any expression of art is essentially a fiction, but knowing that doesn’t devalue it. 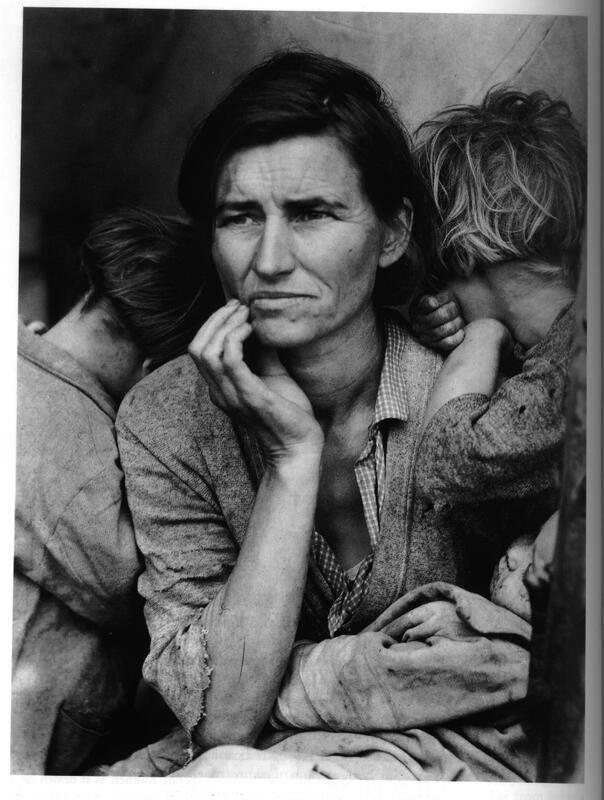 Through our reactions to art such as the work of Dorothea Lange, we are made to ask questions about ourselves and life and, the quality of the experiences we indulge in. For this reason alone, art is vitally important in the development of social and political structures, whether a ‘true’ representation of events and people, or not. Art drives change. Early on, I was influenced by people like Lange, Frank Capa, etc. I didn’t think I wanted to be a war correspondent because I’d learned a lot of those guys actually died in the war. But it did make me prefer “documentary” style photography over studio work. Although I appreciate studio photography, to be it’s as different from the street as classical music is from hip hop. That’s very introspective on the part of Avedon, and his concept that all his pictures are of him in some way. I guess that’s true of anything and anyone, we tend only to see in others what we recognise as being part of ourselves. Things that resonate with us, because they speak of something familiar within our mental and emotional landscape. Art has always got a lesson to impart, in that it either provokes a reaction or none, both are valid responses that invariably trigger further responses. I think we are always in a state of change and thus learning, so anything that propels that is essentially a good thing, I think anyway. I have issues with the concept of truth, as you know. It’s a really grey area that is driven by consensus, though which remains a purely subjective analysis of experience. What truth you can glean from a split-second capture on film is dubious. As a record of events, it speaks nothing of the actual experience, or the people involved. Although there is a part of me that likes the idea that there is more to a photograph than just the stillness that it offers. Photos are an intriguing truth in that they show something that was true for 1/60th of a second or less. We look our best in a photo and then select the one where we appear the most magical (or horrible) and accept that as “us.” But no camera can capture the emotional connections to what is seen. As such, the truth only begins to happen when the photo is displayed, but few ever capture that. I suppose that’s why I take photos of people in museums, rather than of the displays. Thanks. These are kind of labors of love, and I sincerely hope the photographers would be pleased and not feel I was ripping them off or exploiting them. Photography is hard to exhibit, in that photographs remain the intellectual property of the copyright holder (the photographer) for 70 years after death. 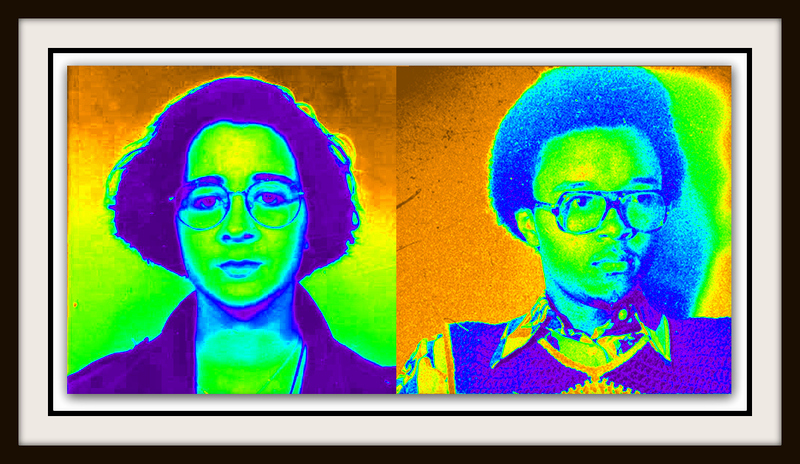 Hers, however, were taken for the government and are in the public domain. I’d be sad if I spent two hours putting one of these together only to be told I was stealing someone’s work. I intend these to be educational posts. I think you’ve done a very good job. Very well written too. Bill, it is wonderful for you to include these influence sections. It inspires me to look more closely at who influences me. Three come to mind, Gregory Crewdson, and Nicolas Nixon and Jeff Wall. Crewdson and Wall compose their images from sets and Nixon worked on stressful subjects such as AIDs, and aging. Lange would be included as well. Thanks, Tim. I not familiar with Crewdson’s and Nixon’s work, I don’t think. I need to check them out. I had Lange’s quote: “The camera is an instrument that teaches people how to see without a camera.” as a header on my blog until the new theme wouldn’t allow it. I too, find her work so very inspiring. Wonderful post! Maya, thank you very much.